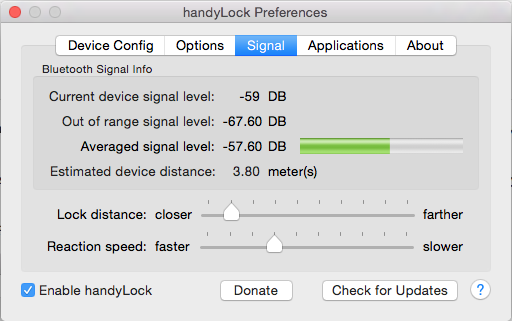 handyLock is an application that locks your Mac screen when you move away from it. This way your Mac is safe and secured from unauthorized access. This is very convenient if you want to prevent access by kids, co-workers or others when you slip away to grab a coffee, a drink or take a bio break. 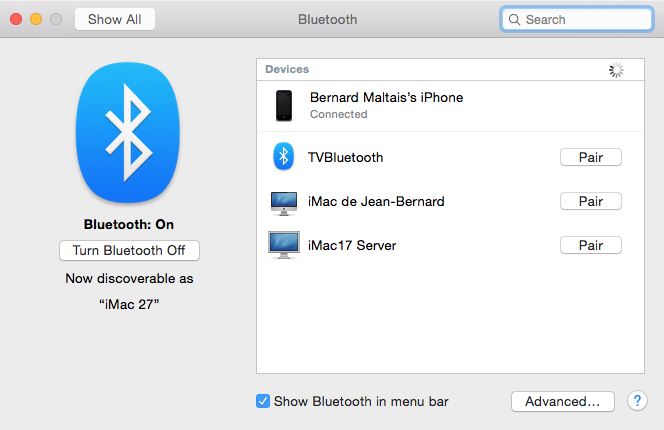 It accomplishes this by pairing a Bluetooth device like your iPhone with your Mac and sensing when this device is getting out of range. As a result your screen will be locked until you move back in range of your Mac. At that point it will unlock on its own. Almost magical! You don’t have an iPhone? No problem. If you have a Bluetooth® enabled Blackberry, iPad, iPod, it will also work! How cool! We are looking forward to receive input on the beta version to improve. As can be seen on the screen above the application requires that you select a Bluetooth device that will act as your “Proximity keycard”. The application engine will dynamically adjust the out of range lock out signal based on dynamically assessing the signal while you use your Mac. This way if you move your Mac from your desk to your jeans pocket it will adjust adapt to the change in signal strength. 2. Start handyLock and set a secure password in case you need to manually unlock your Mac. 4. Select the device that was previously paired and click “Select”. Pairing via this screen does not work at the moment (at least on Yosemite). 5. Put your phone where you will usually keep it when working at your Mac and click “Take reading”. The reading will be saved and shown under “BT device resting value”. If you ever want to change this resting place for your phone simply put it in the new location and click “Set resting value”. 6. Adjust how far the screen should lock. A good starting value is the 2nd left tick mark. Adjust to your taste. 7. Turn the application on by clicking the “OFF/ON” switch. 8. Walk away from the Mac and check if it will lock. Walk back to it and see it unlock. – Fix for device loosing connectivity every 60 seconds or so. – Fix for handyLock wrongly locking during inactivity period while being close to the Mac due to BT connection timing out. – Add a feature that will prevent handyLock from locking the Mac if a user manually perform a soft “logout” by using the “user menu” / “Login window…” option. It will automatically resume once the user login again to his/her account. – Fix for OSX Background not showing when “Change picture every x minutes” option is configured. – Tried to fix issue where the screen lock even if the phone is beside. Might not be perfect but should help. – Re-introduced a custom password to manually unlock the custom lock screen. The OSX solution was really ugly and clunky. I hope you will prefer this one. The whole password is well protected using SHA256 and a per password salt value. – Fixed an issue where the computer would go to sleep after being unlocked manually. – Added a new lock option that run specified application (like AppleScript application) when the bluetooth device goes in and out of range. – Fix for handyLock not locking when BT connection was lost. -Changed the distance logic to self adjust the baseline according to surrounding signal condition. For example, if you put you phone in you pant’s pocket while using your Mac handyLock will keep track of that and adjust the out or range value to compensate. -Added an option to quickly enable or disable handyLock to the menu bar. -Added an option to log events for troubleshooting purpose. -I added the ability to log signal value to a log file to troubleshoot false positive screen locking. 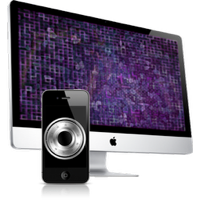 -Added a drop down lost to select different method to lock your Mac: OSX Login Screen, OSX ScreenSaver password or handyLock custom lock screen. Only the handyLock custom lock screen will automatically unlock your Mac when you get near the computer. -Added a check in the helper in case a user goes playing in the archive and start the helper without setting a password. -Added an option to use the OSX Login Window instead of the custom lock screen. The side effect is that handyLock will not be able to automatically unlock your Mac when you get close. instead you will need to login using your account password. This can be handy in case you share you mac between many users or simply want to manually unlock it when you get near. -Added an option to set the number of seconds before the screen will lock when you BT device get out of range. This can help reduce false positive in case something is disrupting the BT signal and cause the device to have moved out of range. -Fixed issue under OSX 10.10. -Fixed the expiry. New version is good until Dec 2014. -Moved back to lock screen that will unlock when the phone get near. 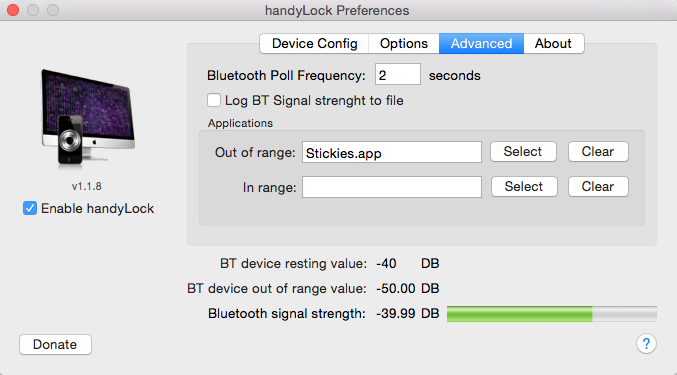 – New “Reaction speed” gage to tune how fast handyLock will react to Bluetooth signal change. The faster the reaction the more subject to false positive (like temporary signal strength drop). – Clicking the “?” in the GUI will prepare an email to send feedback to us. – Fixed logic. Now when switch is ON application will lock screen with or without preference window open. 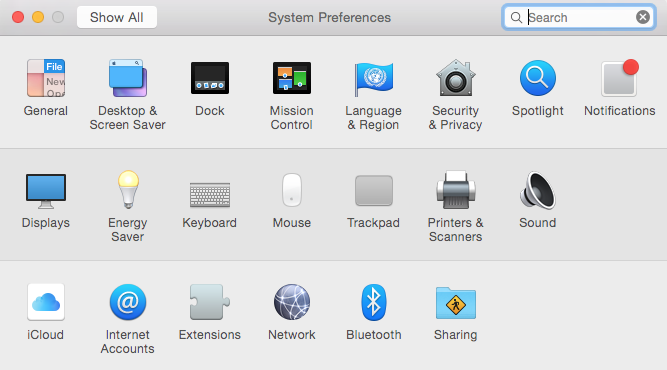 – Fix to prevent accidental screen lock when using the Mac. Not fool proof but should improve things. – New signal strength logic that improve screen lock and unlock accuracy. – Implemented an input field to select Screen Sleep timer. – Implemented a quick fix for screen locking trashing (on/off/on/off) when near the signal threshold. This need improvement. – Much better implementation of screen sleep. Screen saver still not implemented. Will work on this next. Should be easier not that screen sleep is implemented. Was not easy to figure out. handyLock™ is a trademark of Netputing Systems inc.